Tnuza Jamal Hassan, 19, appeared at her arraignment hearing Friday in a makeshift burqa covering all but her eyes. 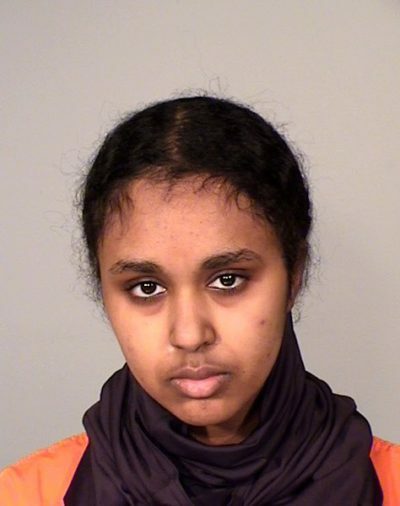 A young woman of East African descent was arraigned in court Friday on charges of first-degree arson after she allegedly set a series of fires on the campus of St. Catherine University in retaliation for U.S. military intervention in Iraq and Afghanistan. Tnuza J. Hassan, 19, is a former student at the school and a resident of Minneapolis, home to a large community of refugees from East Africa, including Somalia and Ethiopia. She reportedly told police she “wanted the school to burn to the ground” and that her intent was to “hurt people,” according to the complaint charging her with one count of felony first-degree arson filed in Ramsey County District Court. …Hassan allegedly told police she had written a letter to her roommates containing “radical ideas about supporting Muslims and bringing back the caliphate,” the complaint said. Over the last 10 years Minnesota has been by far the top resettlement state for Ethiopians, according to data online at the U.S. State Department’s Refugee Processing Center. The letter frightened her roommates, who provided it to campus security.